Digitization Isn’t Wrong, Just Different. Embrace It! As pointed out by Tim Sherratt, we all love the smell of old library books and the nostalgia associated with them so digital content is not always welcomed with open arms by audiences. However, we are doing a disservice to digitization efforts in claiming that it is less than “real life” interactions and experiences. Yes, of course, digital and physical manifestations are different, the point is whether we get anywhere by arguing that one is necessarily inferior to the other. The key is to reconceive loss as difference and use the way the transformed object differs to reimagine what it actually was. Critical encounters with digitized objects make us rethink what we thought we knew. the physical diary changed? Is it somehow less special because it’s physical context is now almost irrelevant thanks to the digitization? To me, it seems that is how we would currently think of this situation. But, if we are to take Mussell and Sherratt’s advice and rethink what we thought we knew, this situation may be viewed differently. 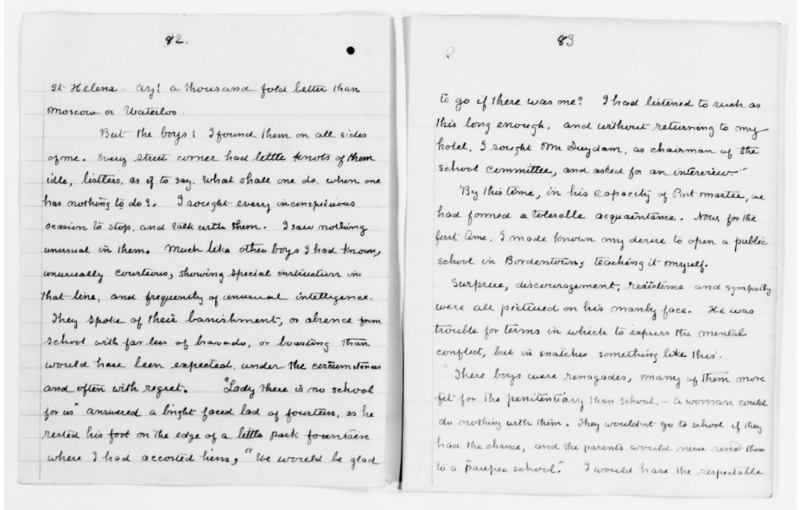 Maybe this digitized version of the diary is seen as an extension of the physical form–a new way to view it that may open possibilities to linguistic analysis in addition to the possibilities available by viewing the physical diary. This is just one example but if we can change our frame of mind and positively reflect on digitization, then the possibilities of accessibility, analysis, and discovery are endless! collections are useless unless they are used. Invite scholars and enthusiasts from outside of your museum to contribute curated content, that includes some of your collections, publish it on your website and possibly make the process visible. 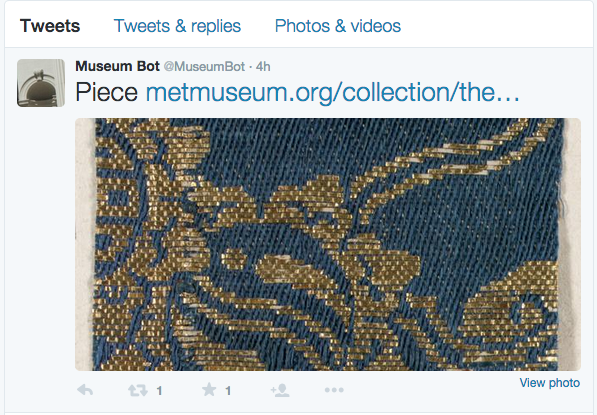 Example of a tweet from MuseumBot that showcases pieces owned by the Metropolitan Museum of Art. Steven Lubar. Though thiese bots showcase seemingly random objects in collections, that randomization should be embraced because it shows pieces that otherwise may go unnoticed if they don’t, for example, align with current exhibitions sponsored by hosting institutions. I really enjoyed your breakdown of thoughts regarding digitizing collections. Your point about digital collections being “an extension of the physical form–a new way to view it that may open possibilities to linguistic analysis in addition to the possibilities available by viewing the physical diary” really spoke to me and my own experiences in the online world. I am a huge fan of putting collections online because as much as I would love to I simply can’t make it to every museum in the world that I want to see, so if instead I can look at their objects or records online, I think that’s such a wonderful use of the internet. When I interned at Ford’s Theatre, my main project was working on their website Remembering Lincoln, which collected digitized responses to the Lincoln assassination from across the country. Ford’s partnered with a lot of smaller institutions, even some tiny local historical societies in the middle of nowhere that happened to have relevant objects. Most of these small places don’t get that many visitors, so this kind of collaboration is a huge deal. And yes, it would be much better to actually see the fragments of tassels from Lincoln’s funeral train in person, but I’m probably not going to take a trip out to Indiana for that. So if people aren’t necessarily coming to your institution, shouldn’t you find a way to make yourself and your collections relevant? I think for large institutions and well-known collections, or even just museums located in major cities, digitizing collections won’t stop us from visiting. Because ultimately,as cool as it is to see Clara Barton’s diary online and to be able to zoom in to extents that we wouldn’t be able to in person (even if we pressed our faces up to the glass to the horror of the employees), I, and I think most people, would still rather be able to actually see it. But we live in a digital age and we might as well embrace it, like you say. Thanks for your comment! I didn’t even think of the possibilities for digitization with partnering organizations and I think your experience from your internship doing so is a great example. It makes total sense that smaller institutions can do justice to their own collections even if it means publicizing their items through more well-known organizations. I also think it’s great that Ford’s Theater did reach out to these places for objects; to me that’s a great example of sharing authority for the sake of a collection. I would love to see more of this happen in the museum world because embracing this only means better experiences for digital and physical visitors. Hey Sam! I really enjoyed reading your post! I especially liked your comment regarding the power of digitization in making history more accessible. Not only is digitization making artifacts accessible, but they are also helpful for preservation purposes. I wonder though whether it will appeal to the niche audiences or encourage a broader audience to look at the less-viewed artifacts. My hope is that it would destabilize the publics infatuation with popularized top-down type history. I may be optimistic. What are your thoughts? Thanks for the comment. I didn’t consider what you’re bringing up here with niche audiences but it definitely makes sense. If people don’t necessarily know what’s in a collection, what are the chances of them searching for a specific object that’s been digitized? It seems that most viewer traffic would come from niche audiences tracking down collection items that they enjoy. Maybe something like @MuseumBot would help in this case though. It could give some attention to lesser known collection items and encourage visitor views? That may be optimistic on my part as well but I take your point about popularized top-down history.